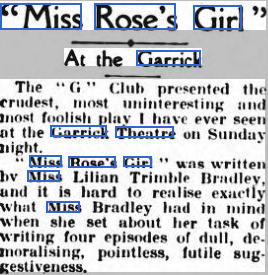 Charles Mortimer was in the cast of "Miss Rose's Girl", at the Garrick Theatre, London, on 8 November, 1931. The play tells the tale of young woman who comes out of a convent, and sees how bad life is in the outside world. From The Era - Wednesday 11 November 1931.